Rainford Tennis Club were today presented with a special award from the coaches and players who are part of the Sam Jalloh Sports Foundation’s programmes in Sierra Leone. The autographed Head tennis ball was signed by all the players and coaches as a thank you to the Club’s support of the charity and their for their donations of tennis equipment. The ball was also signed by Mr Kelvin Kellie, President of the Sierra Leone Tennis Association. 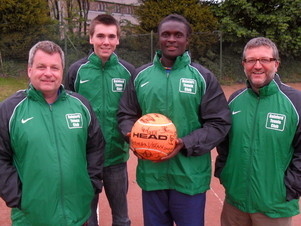 “We would like to say tenki (thank you) to the people of Rainford for their support” said Samuel Jalloh, founder and director of the Sam Jalloh Sports Foundation, who is pictured presenting the ball to John Case, Conor Porteus and Ian Spencer.